Though it seems like we just arrived in Vienna, it’s already time for us to move on to our next destination. 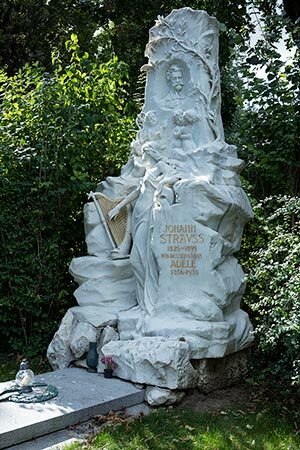 After checking out of our flat, though, we made our way south to see one last Viennese landmark before departing the city—the Central Cemetery. Why oh why would we want to walk around a cemetery when on holiday? Well besides the tranquil nature of these eternal resting grounds, Vienna’s Central Cemetery has the graves of many Classical-area composers, including Beethoven and one of my personal favourites: Johann Strauss. 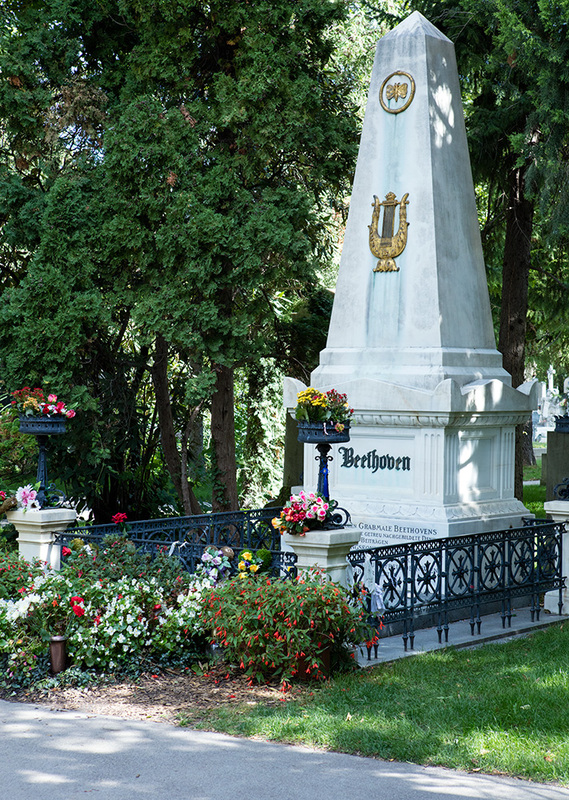 After looking at the famous graves and strolling around the beautiful grounds, we left Vienna for our next stop in The Wachau. 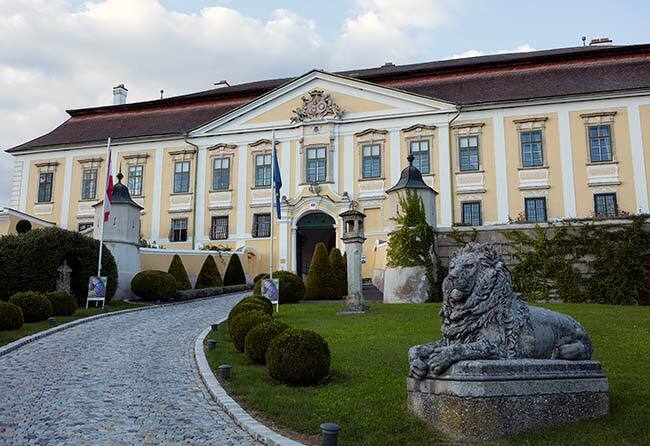 We arrived at Winzerhof Petz (which is located in between the towns of Krems and Dürnstein), checked in, quickly dropped off our luggage, and immediately left for our winery tour at Schloss Gobelsburg. To call it a tour is a bit disingenuous; it was a wine experience! Upon our arrival, we were greeted by an older gentleman wearing a very nice sport coat. He introduced himself as Peter and asked for our names. He then took us through the standard rooms (sorting / pressing, fermentation, ageing cellars, et cetera). What made it an experience, though, was Peter’s outstanding teachings! He taught us about the soil types in the area (even bringing out examples of the stones) , events throughout history that shaped the wine culture of the land, and so many relevant stories from throughout his life. During our tasting (which was essentially every wine they make), we heard about factors influencing the subtle distinctions in terroir of each wine, and more about the history of the truly remarkable estate. For instance, one fact that I didn’t know is that there is a difference in the barrels used in Bordeaux (called barriques and having a capacity of 225L) and those used in Burgundy (called pièces and having a capacity of 228L). Though the capacities differ slightly, the subtly different shape is the fascinating part! The peace has a “hump” in the middle stave section between the hoops. That’s just one example of the many things that Peter taught me during our extremely short 3 hours together. It was an amazing experience that I’ll never forget! 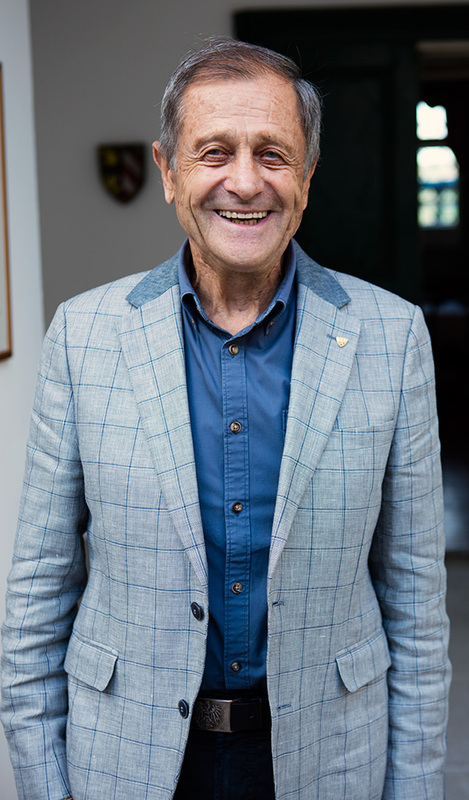 At the very end of this wonderfully educational winery visit, I realised that Peter is the father of Eva Moosbrugger (the proprietor of the estate with her husband, Michael). After Schloss Gobelsburg, we drove to a small town closer to Dürnstein called Unterloiben for our dinner reservations at Wachauerstube Loiben. It was set up in a traditional-style house, and felt very much like being in someone’s home for a meal. We started with an off-the-menu special of grilled mushrooms with a nice salad of greens. 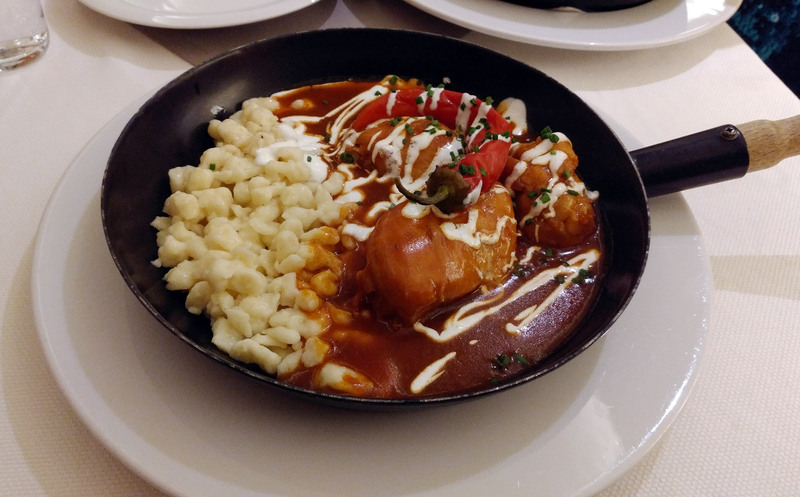 For our mains, I had remembered seeing photos of some of the various dishes offered there, and thought that the Paprika Huhn (AKA “Chicken Paprikash”) looked amazing. Deb and I both ordered it, and boy was it ever good! The thing that was the best about all the food was that it tasted so fresh and clean—a testament to the “farm to table” style of dining. We finished with a dessert of an apple tart which came with this beautiful mint pesto, cream, and freshly made vanilla ice cream. Overall a great meal! We woke up this morning, and the weather looked to be pretty nice. It was sunny in the beginning of the day, but then the clouds came rolling in. It was also extremely windy, which made it feel significantly colder than it actually was. 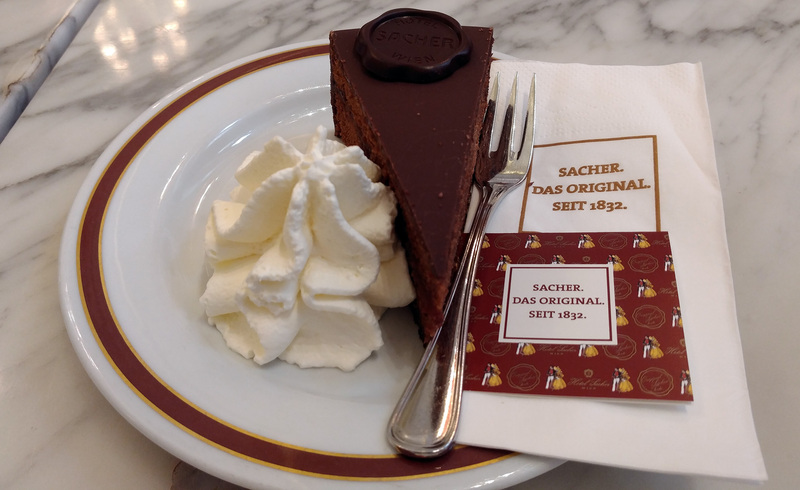 We started our day by heading for Café Sacher. 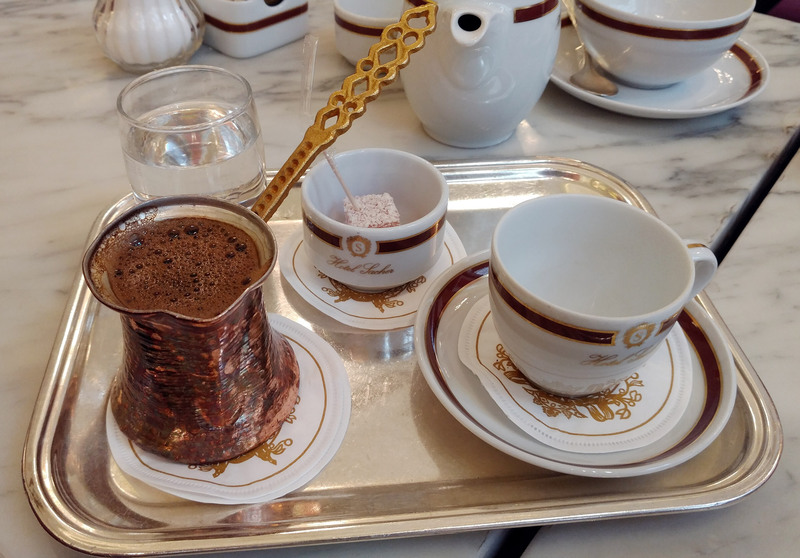 It was a completely different experience than yesterday at Café Demel. For starters, we were promptly seated for our reservations, and our waitress came to explain the menu offerings and take our orders. I started with a Turkish coffee and the crepes with apricots. Deb went for the Original Sacher Torte and a beautiful Assam tea. Everything was wonderful, but I was looking for something a little less “breakfasty” and a little more “indulgent”. So, instead of finishing my crepes, I ordered this spiced ring cake that was dipped in white chocolate. Of course, you can’t have something sweet without coffee, right? So, I ordered two more double espressos (yes, yes, I know that seems like an excessive amount of caffeine and it probably is), and Deb got an additional tea. Overall, it was a great start to the morning. After the café, we took the train back to the flat to pick up the car. We drove about an hour southeast of Vienna to Burgenland for a visit to Weingut Heinrich. When we arrived, we were greeted by a lovely young lady named Katti—an intern at the winery who gave us our tour. We were able to see the sorting / pressing room, the fermentation tanks, and many of the ageing cellars. Katti really made the experience engaging for us by letting us peak inside some of the barrels in which the wines were fermenting. 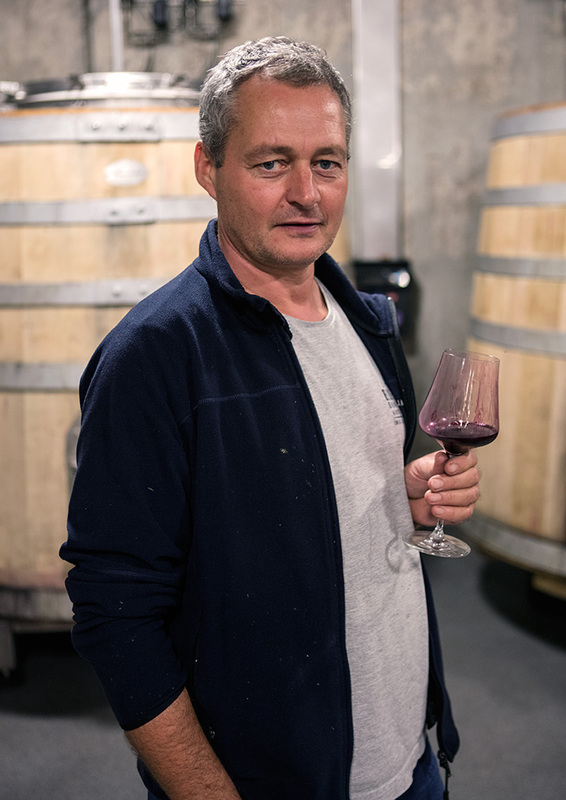 Burgenland – Weingut Heinrich – Barrel tasting with Heinrich himself! 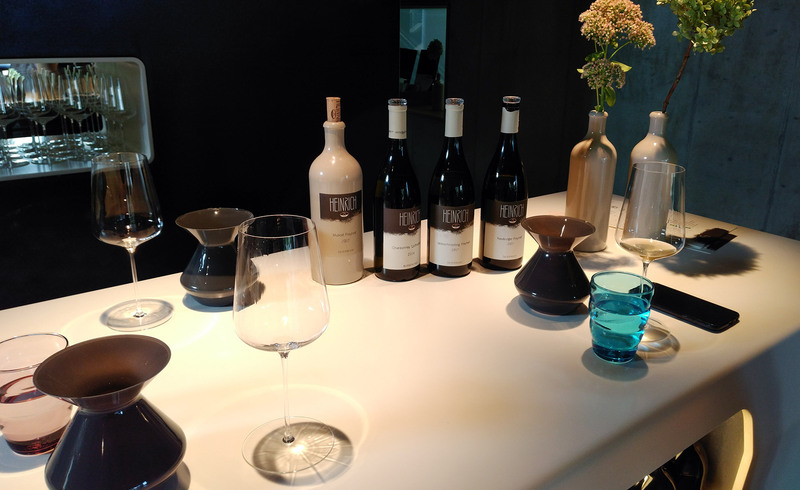 At the end of the tour, we were able to sample many of Heinrich’s lovely wines. The standouts for us were the Pinot Noir, which was beautifully lean and had a great sense of place that set it apart from, say, a German Spätburgunder, and the Freyheit Welschriesling, which was bottled without fining or filtration (leaving it cloudy in the glass). We purchased a bottle of each of them to take with us. Before leaving, we found out that Katti’s family name is Moser, and that her parents are the proprietors of Weingut Sepp Moser in the Wachau (where we’ll be heading tomorrow). Definitely a neat connection, and maybe we can even spend some time at her family’s winery if time allows! Since the weather was less than ideal, we decided to forego the nature reserves around Lake Neusiedl and just head back toward Vienna early. 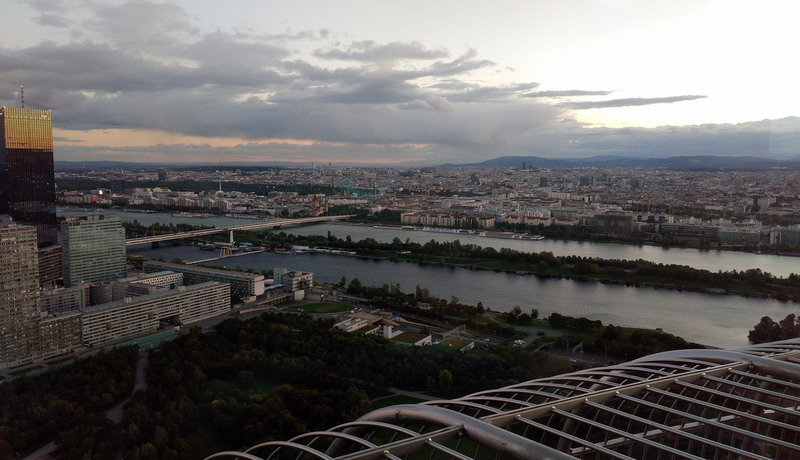 I thought that instead of having a really late night, we could go to the Danube Tower before dinner instead of waiting until afterwards. So, we took the trains to the Kaisermühlen VIC Station, and walked about 1.2 km to the Danube Tower. It was extremely windy, so being outside on the observation deck proved to be unpleasant and rather difficult. We did spend some time just inside the tower just taking in the beauty of Vienna from above, though. After the Danube Tower, we left for our dinner reservations at KitchA. Yes, we indeed had Asian whilst in Vienna, and it was darn good! We opted for entirely vegetarian options including the Agedashi Tofu, wok vegetables and rice, and even some veggie sushi (no fish, obviously). Everything that we had was really tasty, but I think that my favourite dish was the wok-fried veggies. After dinner, we made our way back to the flat for some wine before bed. I went with 2013 Prieler Blaufränkisch (Ried Marienthal [meaning from the single vineyard called “Marienthal”]), and Deb had her Wein Gemischter Satz. These were our more expensive bottles that we purchased at Vinothek St. Stephan, and they were disappointing. So disappointing in fact, that I went down to the corner bar and bought a couple bottles for us to enjoy instead. 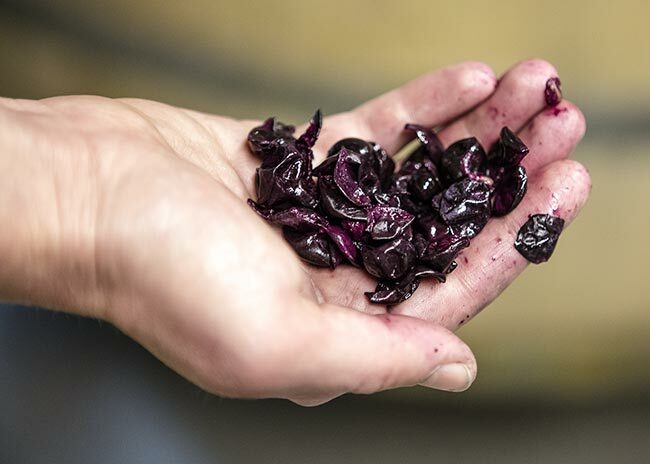 They were Welschrieslings from Weingut Überacker. Great? No, but far better than our other options. 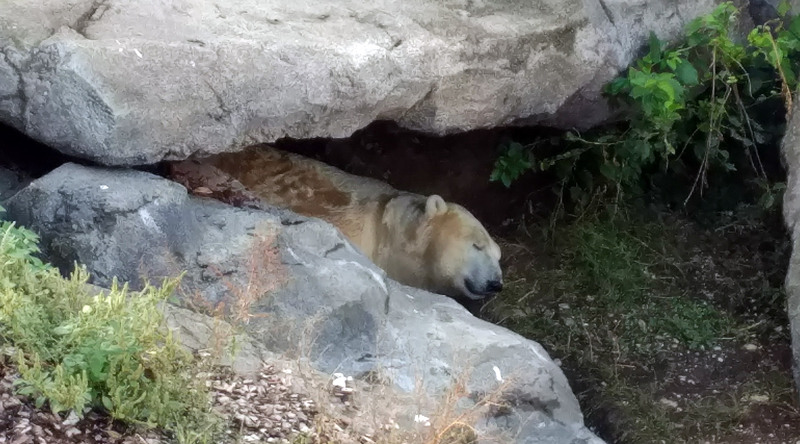 Even though the room was quite comfy, I woke up a bit early and went out to the market to get some more water for the rest of our time in Vienna. I also wanted to see what else was in the area right around our flat. However, since it was Sunday, most places were not yet open… including the Billa market where we went yesterday. I did stop in at a bakery to at least get a couple bottles of water, though. On my way back, there was a florist open, and I found this beautiful and unique rose that had splotches of burgundy and white all over it. I thought that it was perfect for Deb, so I purchased it for our room. She rinsed out one of the bottles of wine from last night, put the rose in it, and stuck it on the table in the living room of our flat. Just like the rug in The Big Lebowski, it really tied the room together. We left the flat and headed for Café Demel. It was quite easy to get there via the underground lines, but when we arrived, the service was dismal. Not only were all the employees essentially ignoring us, but when I asked one about our reservations, she simply said “upstairs” and turned back around. We walked up the stairs and waited in queue. Thankfully I thought to ask the people ahead of us if they had reservations. They said no, so I went around them and tried to speak with an employee on the first floor. Again, they all essentially ignored me. When we were finally seated, I ordered a coffee and Deb ordered a tea. 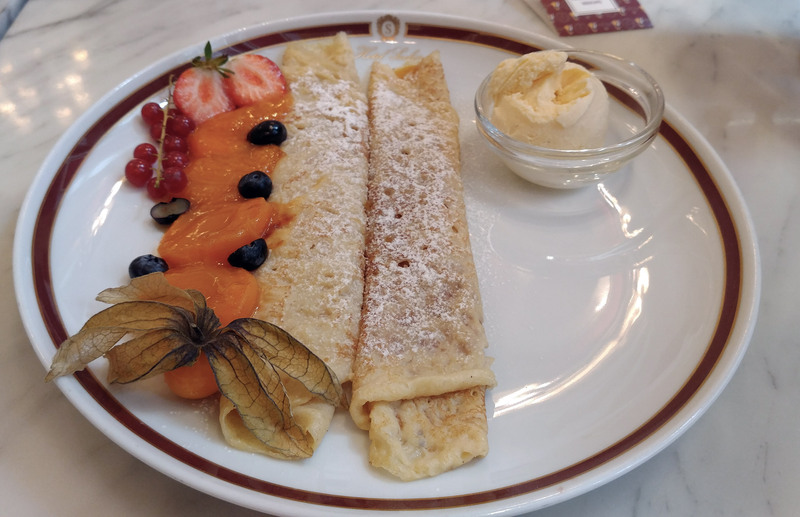 I had pastries in mind for each of us (the chocolate soufflé for Deb and the Kaiserschmarrn for me), but our waiter insisted that we go look at the pastry case. I let my frustration win and just chose from there instead. I didn’t like my coffee (the Fiaker, which is a strong black coffee with a shot of rum) or my pastry, so after Deb was finished with her tea, we just left. It was a completely disappointing and frustrating experience, but I tried to let it go and move on to the rest of the day’s activities. 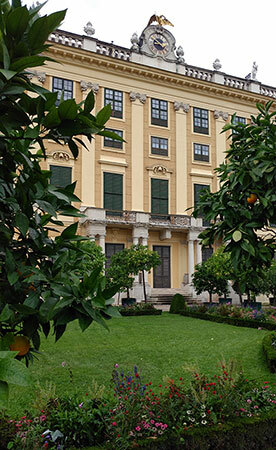 We headed for Schönbrunn Palace for our “Classic Tour” starting at 12:30. The Palace was completely grandiose, and the tour was both fun and educational. I think that we both learned a lot about the Austrian royal family (the Habsburgs), and enjoyed seeing all of the different rooms that they had in their over-the-top dwelling. Instead of the audio tour that essentially everyone else chose, Deb and I went with the paper brochure so that we could have a reference regarding the 40-room tour after the fact. I thought that it was a good choice because we could go back and look at the information after the trip. 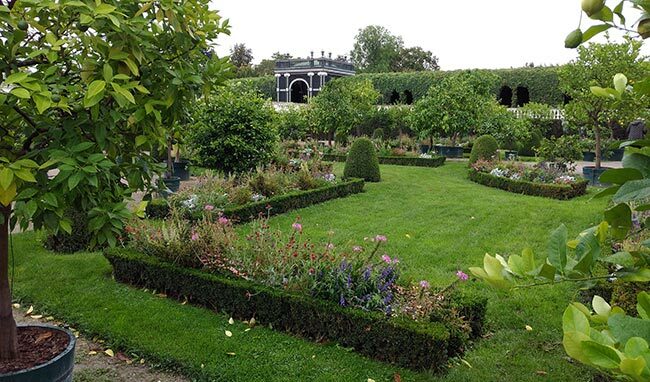 After the tour, we leisurely walked around the grounds, and especially enjoyed the Privy Gardens (which were included in the Classic Pass). They were stunningly beautiful and filled with various citrus trees. The rest of the gardens were open to the public, and we walked through them on our way to the Vienna Zoo, which is technically on the property of the Palace. I stopped for a double espresso at the café right near the exit of the zoo. It warmed me up and gave me a little pep for the rest of our evening. 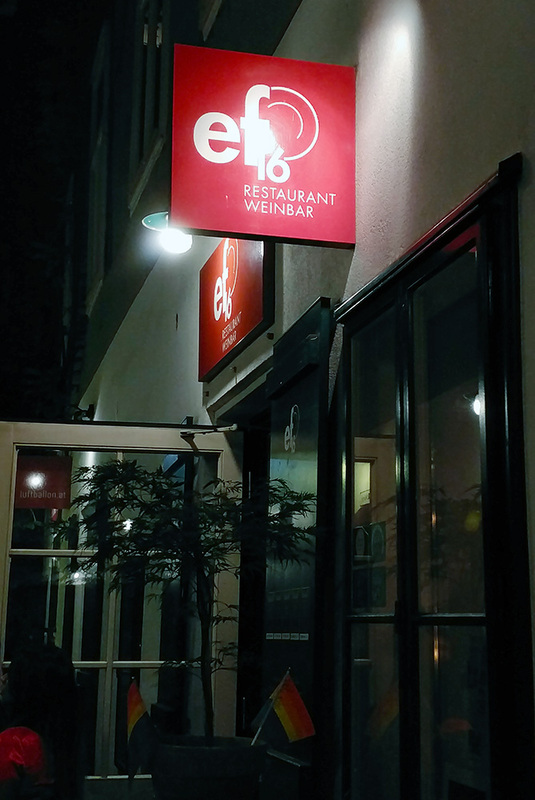 We then headed for our dinner reservations at ef16. This restaurant was a little more difficult to find as it was down an alleyway, but boy was it ever worth the search! The service was absolutely top-notch, and the meals were incredible. We started with two dishes to split as starters—potato gnocchi and pumpkin ravioli. Both were fantastic, but I preferred the pumpkin ravioli because they were different than dishes that we typically get at home. For her main, Deb went with venison ragoût (which also came with gnocchi on the side), and I chose the sea bass with spinach and potatoes. Her dish was exquisite and also had morel mushrooms (yum!). We both agreed that they could have even left out the venison in favour of just more morels (that’s how good they were)! My dish was delicious as well, and the skin of the fish was seared beautifully! The highlight, though, was using the bread (which was some of the best I think I’ve had anywhere) to soak up the remaining sauce in Deb’s ragoût… D I V I N E.
I wanted us to each have some wine with dinner, and chose slightly more unique pairings for our starters and mains. I went with a Weißburgunder (Pinot Blanc) for our starters, and then a Merlot from Burgenland for Deb’s dish (which I thought paired far better than the Cabernet Sauvignon that the waiter recommended), and a unique blend of Zweigelt and Pinot Noir for my dish. It worked well with the fish, and was a nice deviation from the standard “whites with fish” pairing rule. After dinner, we made our way back to the hotel to further embark on our Austrian wine journey. I had a 2012 Granit Zweigelt from Weingut Kurt Angerer, and Deb went with the 2016 Grauburgunder (Pinot Gris) Reserve from Weingut Schwarzböck. 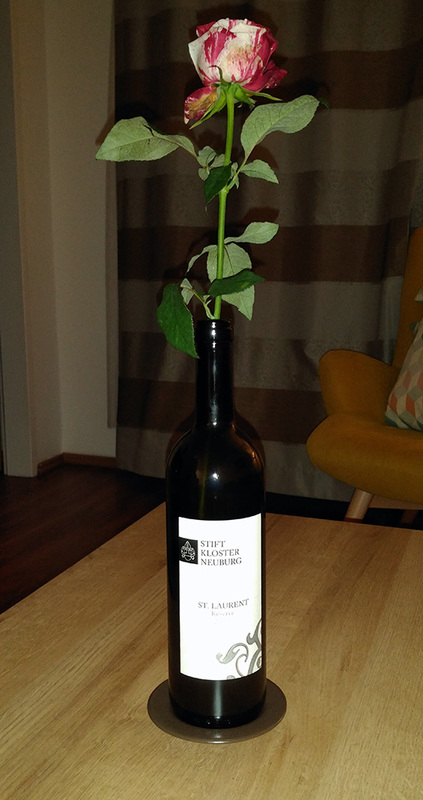 Mine, like the St. Laurent from the night before, was sharply acidic, but a bit simplistic. Deb’s was quite nice, but also lacked the floral intensity of the Zierfandler-Rotgipfler that just jumped out of the glass. They were good wines, but so far the Zierfandler-Rotgipfler has been the stand-out (which is awesome at under €10 per bottle, retail)!